A white feather is often your loved one saying hello. Coping with a loved one’s passing is difficult. While it’s natural to feel despair, anger, distress, and loss, if you believe that death is not the end, you are perhaps at an advantage over skeptics. You have the faith to understand that you will see your loved one again. You don’t have to wait until you get to the other side though; it’s entirely possible they will attempt to contact you right here on earth. An online psychic chat can help you communicate directly with your departed loved one, but here are seven more subtle signs to watch out for. Feathers are a common way for loved ones to let you know they're still around. Feathers will appear when you least expect it, and usually seem to come out of nowhere. Finding one on your pillow in the morning is an obvious sign, although you will often experience a white feather falling from the sky just in front of you. If you and your loved ones shared a special song, or you played a particular song at a funeral, it’s likely that you will hear this song again. It might be that you turn on the radio to find that’s it’s already on air, or you may hear it from a passing car. Orbs have appeared on photographs for years, but the increased use of smartphones and digital cameras have made them clearer than ever before. Try zooming in and you’ll notice how incredibly intricate and beautiful these orbs are. While it’s fairly common to dream of a loved one, a clear sign that you have actually experienced a dream visitation is when you talk to your loved one. You will also notice that you are able to recall your dream more easily than usual. These dreams are a way for loved ones to tell you they have passed over safely. 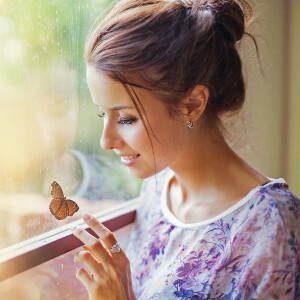 An ancient Chinese legend states that butterflies are visiting souls, so if you see a butterfly, there’s a good chance it’s actually your loved one paying you a visit. It’s even more likely if the butterfly comes unusually close or lands on you. You will often associate a specific smell with loved ones. It might be that they were a smoker, wore a particular perfume, or loved a certain type of flower. Noticing these smells when there is no reasonable explanation for you to do so is a sign your loved one is close. It’s fairly easy for people on the other side to manipulate electrical devices. If your television changes channel on its own or your kettle starts boiling inexplicably, there’s a good chance it’s your loved one trying to get your attention. If you are experiencing any of these signs but are still unsure about whether your loved one is trying to contact you, talking to a psychic might help you make sense of your feelings.